We also have some new products added to the Archer Airguns online store, one of which is a genuine Benjamin air rifle sling. This Benjamin sling fits directly to Benjamin break barrel air rifles featuring a forward loop mount and rear swivel base. Constructed of 1-inch wide black synthetic webbing with a wide padded section bearing the Benjamin logo. This sling makes carrying an air rifle in the field much easier and safer. 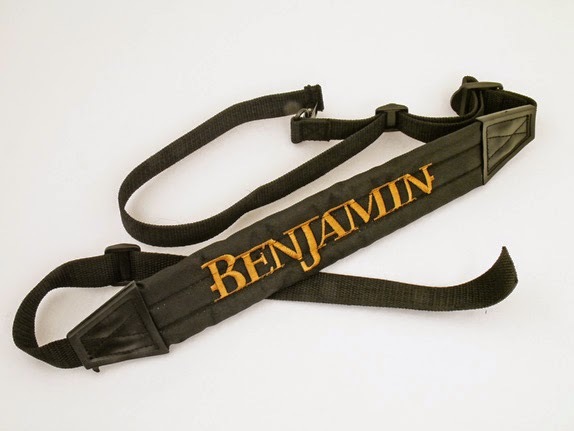 The Benjamin air rifle sling can be used with Marauder air rifles with the addition of a set of 1-inch sling swivels. (Actually, you only need one sling swivel as one is supplied with this sling). There's more new stuff coming shortly. Thanks for your patience!